Analyze your network performance NetVelocity’s Multi-technology support! Home/Multi-technology support/Measure, compare and share your network performance using NetVelocity’s Multi-technology support! As per statistics, there are about 2.5 billion active Android devices, 1.2 billion active iOS devices and 2.8 billion total number of LTE subscriptions globally. 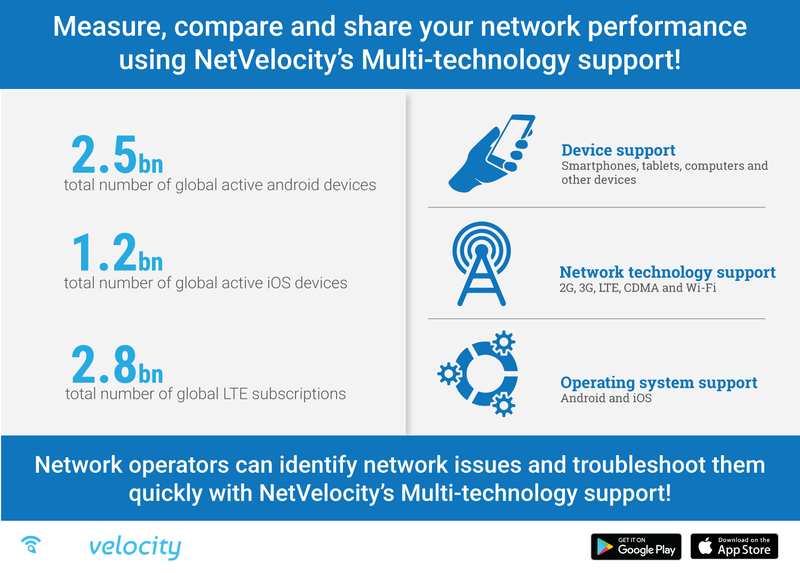 NetVelocity app enables its users with multi-tech support that facilitates the users to measure, compare, and share their network performance on Android and iOS devices thereby using 2G, 3G, LTE and Wi-Fi networks. Therefore, the NetVelocity application offers multi-technology support thereby providing details of specific parameters of each technology. This facilitates the network operators to identify the network issues and aids them with technical support to troubleshoot the issues in a quicker way.